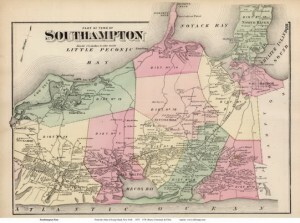 Town of Southampton. Courtesy of www.old-maps.com. Recently, I was searching for records in the towns of Southampton, Easthampton, and Bridgehampton, all in Suffolk County, New York. I was trying to determine the identity of the father of Abraham C., who was born in 1720 in Southampton and died about 1785. The client had done some excellent research, and through his efforts, concluded that there were two possible outcomes. Since finding direct evidence from records for New York during this time period can be tricky, I examined numerous publications from our NEHGS collection, including town histories, such as the multi-volume series Records of The Town of Southampton, With Other Ancient Documents of Historic Value; published genealogies; and the excellent New York Genealogical and Biographical Record. I examined microfilm of Southampton cemetery records as well as Easthampton marriage and birth/baptismal records. And, of course, I searched for Abraham C. and his potential fathers in probate and land records. Ultimately, a land record provided a potential connection for Abraham C. The record came from a volume of transcribed records for the period 1717–1807; however, I also needed to locate the original land deed in order to find the exact year of the transaction. Therefore, I contacted the Town Clerk at the Town of Southampton’s Historic Division to see if they had any information pertaining to this deed. The Historic Division was created by the town clerk; it is separate from the Southampton Historical Society. According to its website: “The division maintains the historical records with the town historian leading the effort of researching, recording, obtaining, and preserving the historical documents and archival information contained within the Historic Division.” Southampton was the first English colony in what is now New York State, and the town has records beginning in 1640. I was directed to the Southampton Town Historian, who pointed me to several new and/or updated digitized record collections on their website, such as their historic cemeteries project. He gave me names and suggestions: people to contact at the Hampton Library in Bridgehampton, the Historical Documents Library at the Suffolk County Center in Riverhead, the First Presbyterian Church of Southampton, and the Bridgehampton Presbyterian Church. But even more importantly, he supplied the historical context for my searches, information that is always extremely helpful when searching for genealogical records. One of the things I learned was that today’s Brooklyn Historical Society was originally founded in 1863 as the Long Island Historical Society: an unexpected resource for Southampton research. I’d like to say I found that smoking gun; not yet, but I’m hoping that, through my new sources provided by the Town Historian, I am getting ever closer. Nancy, how does one go about finding New York records of that ever so common man and his family when he owned no land, served in no war, lived in New York before 1840, and left no Will? My ancestor, Erastus Lee, who moved into Michigan, stated he was born in New York in the 1850 census – but beyond this there are (3) men of that same name living in New York in 1840 ….not sure where to turn!? None of them seem to be a good match – though perhaps they are of the same family(?) I doubt he would have been patrician or significant enough to have been included in local area history. – It is so discouraging – I have wondered about the possibility of the existence of a “migrants list” or list of of perhaps journeymen who came over and across to Michigan through the Erie Canal – would there be records of who those people were? I sure appreciate your great article, and I like the fact that you too are “still searching” on behalf of your client in the great genealogical vortex that is 18th and 19th century New York. At least Massachusetts was kind enough to record most of the comings and goings of the common man – unfortunately, it is my experience that the Empire State only seemed to give records and accolades to there finest citizens, leaving the ordinary man to be all but forgotten. Jeff, the people at FamilySearch.org have been microfilming and transcribing church and cemetary records throughout all of the states, so I would look first to see if the records you want have been transcribed yet, and then lookat their catalog to see if they have yet filmed the areas church records and or cemetary records. If they have been filmed, then your nerest Family History Center can order the film for you to look at when they are open. Jeff, I had the same problem, years ago, pre-internet. Solved by the Town Historian of little Oxford, NY. State law requires this post; she was excellent! Try writing to each of the towns you know of, the Historians are listed online now. They have maps, books, newspapers, diaries, whatever has been saved over the years. Most towns have Historical and Genealogy Societies that may be able to help. And you may find that your ancestors moved to NY because of Revolutionary War pension or bounty lands for veterans. More records! And, many families, like mine, came to Illinois or Michigan with others from their NY towns. So try your local courthouse, historical society, etc. for clues to the town in NY. Good luck! Thanks so much for the great ideas – they are a much needed boost!! !